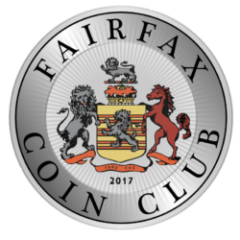 The Fairfax Coin Club is a privately funded non-profit organization, supported by membership dues, donations and auction fees. Fairfax Coin Club is organized exclusively for charitable, educational, and scientific purposes, in the realm of numismatics, and will conduct activities that will qualify the Club as an exempt organizations under section 501(c)(3) of the Internal Revenue Code. To encourage and dispense numismatic knowledge and cultivate fraternity among its members. To encourage and promote coin collecting by advancing the knowledge of numismatics along educational, historical and scientific lines. To provide a forum for members to obtain and dispose of numismatic items. To encourage the youth to develop an appreciation for the study of numismatics. To provide an educational forum for the general public and share numismatic knowledge with them. Applications for individual, young numismatists and family memberships are available. The Club’s governing board reviews all applications. Online applications for memberships and renewals are available for download below. Membership applications may be mailed, emailed or bought to the next meeting. Annual dues are collected for the upcoming year at the start of the year in January . Regular member dues are $20 and Young Numismatists dues are $10. Family Memberships are available per request. A one time dues payment of $200 will be collected for Life Members. Honorary Members and Special Members are not required to pay dues. For new members who join during the middle of the year, dues are pro-rated for the remainder of the year. The Fairfax Coin Club encourages young and aspiring numismatists to join the club. Young Numismatics who wish to apply must be between 10 to 18 and be of good moral character. A parent or guardian must sign the submitted application.